During the 19th century there were two main ways of entering the surveying profession in England. Young men could learn mapping and navigation skills either in the army or navy, or as an articled pupil to a private surveyor. Many of the private surveyors at that time worked on railway or canal sites. The latter entry was limited to young men of means, as the master surveyor charged the pupil's family for his keep and training. 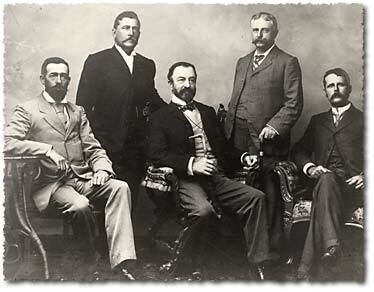 In the Australian colonies, government departments were the chief employers of pupil surveyors, the Surveyor General being the largest department at that time. A young man would enter the department as a clerk and then progress through draftsman and then to assistant surveyor. Many of the first surveyors sent to the Australian colonies by the Home Office proved to be unsuitable. To remedy this, Governor Sir Richard Bourke directed, through proclamation in the New South Wales Government Gazette on 6 September 1837, that all candidates for employment as an assistant surveyor should appear before a Board and be examined. This was also the procedure for licensing surveyors in the district of Moreton Bay and continued after separation until 1868. Soon after the state of Queensland was proclaimed in December 1859, surveyors could be licensed under Section 118 of the Real Property Act 1861. This was done by the Registrar General on the production of a certificate of competency from the Surveyor General. James Warner was the first surveyor licensed under this Act. Real property surveyors continued to be licensed under this act and later under sections 41–45 of the Real Property Act 1871. Under the provisions of the Crown Lands Alienation Act 1868, surveyors were licensed to carry out surveys under the proviso that they had a certificate of competency from the Surveyor General. The rules for a surveyor to obtain a licence were described in the Queensland Government Gazette. The qualifications differed greatly under the two acts: Crown Land and Real Property. Under the Crown Land Alienation Act 1868, surveyors had to be able to subdivide original surveyed portions, make feature surveys, prepare designs for roads and survey new portions. Under the Real Property Act 1861, surveyors were only required to subdivide land where the outer boundaries had been previously marked out. After 1868, various crown land acts came into being. Surveyors of crown lands could make application to be licensed to carry out surveys under those acts (i.e. 1876, 1884 and 1897). sit for an examination on surveying type subjects. Charles Brunsdon Fletcher, Licensed Surveyor. As surveying became more scientific and complex, extra subjects of Astronomy, Geodesy and Town Planning were added to the examinations. The length of service under articles increased from 1 year under the 1868 act, to 4 years under the 1897 act. In 1908, the Land Surveyors Act came into force, repealing the relevant sections of the previous acts. This brought the registration of surveyors under the control of the Surveyor's Board, with only one type of registration for both crown land and real property surveys. After this act, surveyors were known as authorised, not licensed surveyors. After working in the field for a number of years to gain practical experience, cadet surveyors would often come to Brisbane to finalise their examinations. Due to the difficulty of studying complex subjects in remote survey camps, most cadets had the required field experience, but had not passed many of the theory subjects. The best jobs for these cadets when they returned to Brisbane were in the public service departments of the Surveyor General and Titles Office. Work was not demanding and the hours were liberal. The cadets spent their last year of apprenticeship as a public servant earning £150 per annum, working from 9am to 5pm weekdays and until 12 noon Saturday. Once they had passed all examinations and reached the age of 21, the cadet could then become registered as a surveyor. Up until 1964, to become a surveyor, a pupil was required to gain experience in the field with a practicing surveyor. They then sat for the Surveyors’ Board examinations to gain their licence or registration. By this time, there were many surveyors in the profession who were dissatisfied with the articled system as a means of training young surveyors. They believed that any bad practices of the master surveyor would be passed onto the pupil. They also believed that some surveyors saw the pupil as a cheap form of labour. Although the University of Queensland had started the Surveying Degree course in 1937, it was not until 1964 that it became the only way of entry into the profession. Learn about Queensland’s historical surveying processes. View images of instruments and equipment used to survey and map Queensland.